November 7, 2011 - A GE study of airspace around Sun Valley Airport has identified significant improvements in airport access that could be achieved during periods of inclement weather with the deployment of new, advanced instrument approach procedures. The study found that new procedures, using Required Navigation Performance (RNP) technology, would allow Bombardier Q400 passenger turboprops, like the ones operated by Horizon Air, to operate at Sun Valley on days of low ceiling and visibility that currently force diversions and cancellations. Sun Valley Airport (Friedman Memorial Airport) is a city-owned public-use airport located in Hailey, Idaho. The airport is operated by the Friedman Memorial Airport Authority under a Joint Powers Agreement between the City of Hailey and Blaine County. It serves Sun Valley and the surrounding areas in the Wood River Valley. The airport covers an area of 171 acres at an elevation of 5,318 feet above mean sea level. It has one asphalt paved runway designated 13/31 which measures 7,550 by 100 feet. In addition to lowering decision heights and visibility requirements for commercial carriers, new RNP procedures could also provide benefits to general aviation and business aircraft operators at Sun Valley, depending on aircraft type, crew training and performance capabilities. Based on study findings, the deployment of new optimized RNP approach paths would allow Q400 Turboprops to land at Sun Valley on days during the year when weather conditions currently prevent them from operating. Unlike other possible alternatives for improving access at Sun Valley airport, the deployment of advanced RNP procedures would require no additional ground infrastructure, either on or off the airport property. "The beauty of RNP is that it relies on performance characteristics of the aircraft itself, incorporating GPS, advanced instrumentation and computer-based navigation capabilities, to define a very precise trajectory. The technology frees the aircraft from the constraints of ground-based radio-navigation infrastructureThat means we can continuously improve the procedures without the need to add additional ground-based equipment," said GE Aviation Technical Fellow Steve Fulton. After the RNP procedures are deployed, over time, they could be optimized to further lower decision heights, reduce visibility requirements, and allow RNP operations by multiple aircraft types. GE Aviation's study was conducted in cooperation with Horizon Air and general aviation operators, and was underwritten by airport users who value reliable air service into the Wood River Valley. Horizon Air is a regional low-cost airline based in SeaTac, Washington. It is the eighth largest regional airline in the USA, serving 52 cities in the United States, Canada and Mexico. 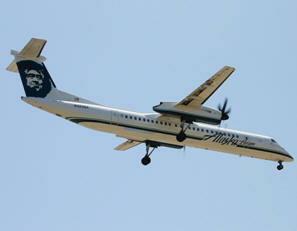 Horizon Air and its sister carrier Alaska Airlines are subsidiaries of Alaska Air Group. It is also a substantial codeshare partner of American Airlines and Delta Air Lines.